Topics: Gallery, and Mondo, Gallery, and Mondo. 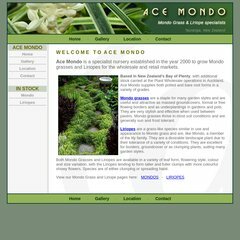 acemondo.co.nz Ace Mondo - Suppliers of Mondo grasses and Liriopes. It is hosted by Iconz Internet Service Provider Auckland, using Apache/2 web server. Its local IP address is 210.48.108.132. ns.freeparking.co.nz, and ns2.freeparking.co.nz are its DNS Nameservers. PING www. (210.48.108.132) 56(84) bytes of data.